In this age where bullying has once again overcome the land, The Duck Dragon has awareness of its divine beauty while at the same time it can’t stand somebody telling it that it looks like a duck. The Duck Dragon finds itself hating the hater and losing its own way. How will the Duck Dragon find its inner beauty again? I think I made the original book, “The Duck Dragon” around the age of 9 or 10 in a special class where everybody made a book. The color palette and shapes and story of the Duck Dragon gave me room to celebrate my tender unique sense of self and to honor the reality of teasing ostracizing, and humiliation that were just around the corner. 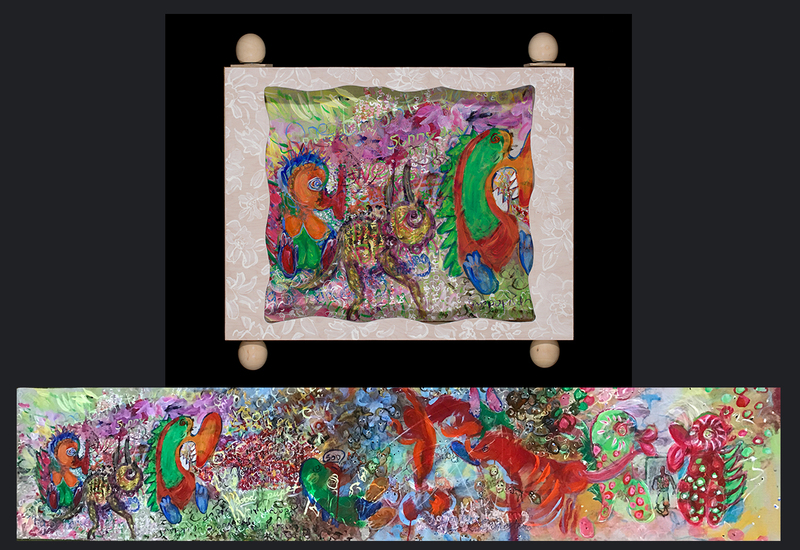 “The Duck Dragon” is one of many recent works that I’ve created on a scroll. The scroll allows the opportunity for slow and creative viewing. Turn the knobs, take your time and view the scenes and the transition between the scenes.